As people rush past, Chuckles sips his coffee and stares through the large window onto Buchanan Street. His expensive coffee is his last of the day. As far as all of this rushing, consuming horde are concerned, well, they've rejected him, they don't notice, so he has every right to criticise and laugh into himself at their ignorance to his plan. Helen dips her finger into top of her frothy coffee and stares at the man in black sitting across from her table and wonders about the interesting thoughts he must be thinking. She has seen him here before. He never seems to notice anyone, his stare always seems to be reversed. Staring back into the infinity that must be his mind. She loves to speculate on what everyone's lives are about. She guesses he is an artist of some sorts. And lonely. Chuckles checks his phone. It is nearly time. He must be on Hope street for 5.30. It is 5.15. He has all of the stuff he needs. His phone, his bag and its soon to be criminal contents. He unfolds his newspaper. It has no doubts. Like all of the newspapers in Scotland today. Helen watches him unfold his paper. She reads the headline. It is about tomorrow. She wonders if the man in black has the same opinion as the headline. She stopped buying this same paper because of its views on Scotland's day; tomorrow. He looks towards the Buchanan Street steps. A battle of PA systems, Yes and No signs and flags has broken out. The crowd are singing at each other and the media thrust microphones in front of red, alive, intense, faces. He chuckles at their certainty. She hears the singing and sees him laughing. Is he laughing at the melee or at one or the other sides? She sees intent in his eyes and rather than taking off his black baseball hat, he pulls it down tighter onto his head, concealing his dark eyes. She thinks, "if he is from the other side, I should keep an eye on him. They can't be allowed to win." He stands and knocks back the last drop of his large Americano with two extra shots. He'll need this, he thinks. It'll keep the adrenalin at an alert level. He lifts his bag, slings it over his shoulder and makes for the stairs. She lets him walk past and regretfully, she leaves her half full cup and follows him down the stairs, pulling on her green, zip up hoodie. She pulls her red curls into the hood. She knows she is recognisable and she is sure he looked at her. He steps out onto Buchanan Street, pauses to look at the scrum of Yes and No campaigners, politicians, media and the temporarily sane. He smiles at their certainty. He feels he is justified in what he is about to do. He hates their posh, rich, certain voices and the fact that manipulate their supporters with certain, manipulated, unrelated factoids. The world must know the truth and he is the one to ensure they do. He turns to walk down the hill. She watches him watch. She follows his gaze. Which side is he on? The side of decency or the side of the uneducated? 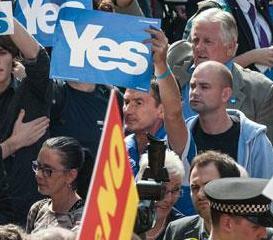 He remembers his message to the No campaign. The Better Together offices are not accessible to the public. The Yes offices are. He knows they will receive his message soon, by courier. His message to the Yes office is going to be delivered by the contents of his bag, in a few minutes. Their whole office will know this message. It will be clear. Their certainty will shatter. He knows this. His message is subversive. But clear. Certain. She watches him clutch his grey duffle bag closer, under his arm. She knows he is going to do something. He darts down a side street. She follows. He stops and lights a cigarette. She has no choice but to walk past. Hopefully at the end of the alleyway, she can find somewhere she can stand and watch him again. He wants to make sure he hasn't been followed. He has been saying to his 157 followers on Twitter that today he will knock the certainties. The new voice will enter the fray. He will challenge these bastards. He stops; pretending he is sheltering to light up a cigarette. As he draws on the Benson, he notices the tall girl in the green hoodie. A red curl betrays her. He has seen her before. In the cafe. Is she following him? She walks past him without looking at him. He must not let paranoia stop his plan. She turns left and walks a few paces to a bus stop and hides behind a round, sweating man holding two large "Bags for Life" full of tins and packets. He emerges from the alleyway and crosses the road. He wants to take a detour to deliver a letter to the Yes Bar, a bar that used to be called the Vespbar until they became certain. She watches from behind the perspex of the bus shelter. He walks down the street opposite and eventually ducks down another side alley. She knows what lies down that street. The traffic has stopped at the lights up the hill, so she runs across, her hood falls and her hair cascades onto her shoulders. He is up to something. This mysterious man in black has secrets she must know. Is he out to thwart the cause? To leaflet, persuade or to cajole people to vote against their own interests? Or is he out to embarrass one of the other kind? Is he an agent provocateur for her side? She turns the corner as he walks through the door of the Yes Bar. Is he going in to support or to jeer? He walks to the bar. The woman behind the bar smiles at him. Another certain person. He knows she is certain. When he downs the pint of lager he takes the envelope out, sets it on the bar and turns to leave. There she is again. The beautiful red haired woman with the green jacket. She is looking at him. He stares at her as he walks past. Is she following him? Has she read his posts on "The Scottish Rebels" Facebook site? Is she one of those who have dissed his views? Is she MI5? Is he paranoid? He looks at his watch as he walks through the door onto the street. It is 5.34pm. He turns left and then left again onto Hope Street and quickens his pace up the hill towards the Yes offices. She rushes out after him. She knows she may well have been spotted, but she is sure he is going to do something wrong- or right. She is certain. Her heart is pounding. His dark eyes penetrated her soul the many times he has stared straight through her and shook her bones just now when he noticed her. She feels she knows her destiny. He faces the Yes office door. It is still open. Of course it is. Tomorrow is the referendum, they will be pedalling certainties all night tonight. Scotland decides. And they are all so bloody certain. Alex Salmond, Jim Murphy, Johann Lamont, Ruth Davidson, Patrick Harvie, Colin Fox, Blair MacDougall, Blair Jenkins, all of them certain. She is certain. She stares at him standing outside the Yes office. This is either going to be great or terrible. Either way, this man of deep secrets will be revealed. The inward gaze, his thoughts positive or negative will show themselves, she is sure. Should she call the police? Yet what he does could be amazing. It could swing tomorrows vote. Scotland could decide as she has. He looks from left to right. He knows he must do this. The Yes Bar, The NO Campaign, the political leaders in Scotland, and in London and in the United States will have read or will be reading his statement now. Doubt will now be working through their certainty like a virus. Everything changes TODAY. He loosens the cords on his duffle bag and plunges his hand in, grabbing the cold metal and he pulls it out, directing it at the glass. He has practised this in his flat many times. She cant breathe. He is taking something from his bag. She'll be an accessory to a dark crime. A crime that could change Scotland forever. A crime that might hasten or retard Scotland's future. What should she do? She looks from left to right. The traffic is moving, but like all rush hours, even on the eve of this momentous vote, work goes on. The hive must gather honey or die. He points it at the glass. The young people in the office look on in horror. He sees their certainty fade. And he knows those who open the couriered packages and envelopes will feel the same. Their messages of definitive answers will falter and crack. And somewhere someone will understand that there is more to all of this. She watches him, puzzled. He turns, his dark eyes darting from left to right. The traffic stops and he launches himself across the road. In an office across from Kelvingrove Museum, one of Ruth Davidson, MP's office workers opens the envelope and reads the short sentence out loud and shakes his head as he sets it aside. Susanne in the Yes Bar passes the letter to Jim, her husband. He reads it and chuckles. Rob looks puzzled as he reads the neatly written sentence and passes it across the table to Blair. The Better Together offices have never been so busy, and he is tired, so perhaps he isn't focussing on what he has just read. Blair will sort it out. Deputy First Minister Nicola Sturgeon is handed the note as she leaves the BBC News set. She scans it and quickly hands it back to her researcher. They both look puzzled at each other and then smile. The coming weeks are going to be out of this world. Ross Greer of the Greens stares through the Yes office window. He marvels at the fact the graffiti artist is spraying the words backwards so they can read them inside. They are the same words he read this morning as he went through Patrick's mail. As Chuckles runs across the road laughing, Helen reads his message backwards. Scrawled in red paint is, "Mibbees aye, Mibbees naw." She runs into the road and stands in his way. He stops, shocked. Is she MI5? Is she a mad Scot or Brit nationalist about to chib his throat? Her eyes are as emerald green as her hoodie and they pierce his soul. She smiles. He smiles nervously at this angel who has noticed him. She looks into the darkness and knows she has work to do.